I get this question all the time concerning my baskets. My usual answer is, "I use it to sit on a shelf and look at it." This isn't being cute, I simply see baskets as works of art to be displayed as you would any sculpture or painting. I don't consider my baskets to be useless, they are just non-utilitarian. Also, most of the baskets I make these days have nearly $100 or more in materials alone. I am not going to be going out to the garden with a hundred plus dollar basket. With all that said though, I still do "use" some of my baskets. I have a large black ash basket that is my work/shopping basket that I take to craft shows and carry my weaving supplies around in. I also have an ash basket that I made a draw-string liner for that I use as my tool basket. And I have a nice white oak basket that found at an estate sale that I take the farmers' market. These baskets are all utilitarian forms that I use in a utilitarian fashion. Pretty much all of the baskets that Eric Taylor teaches are designed with a specific function, e.g. tool tote, business card holder, napkin basket, etc. I have made many of Eric's baskets, but like with most of my other baskets, they are simply display pieces, that is, except for Eric's Cottage Jewelry Basket. 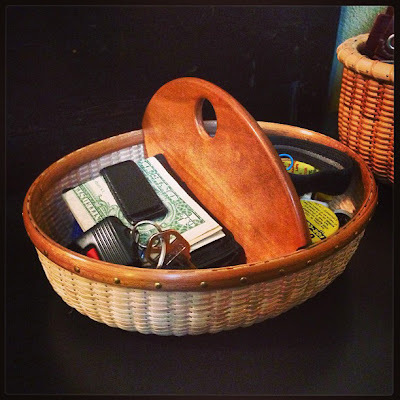 Cottage Jewelry Basket - black ash and cherry. 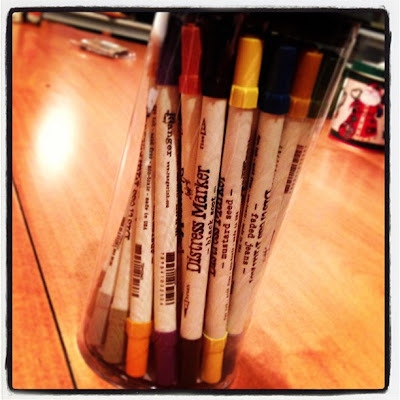 I am very excited that I finally got a set of Tim Holtz Distress Markers by Ranger. I asked for them for Christmas (because they are over $100 for the set!) and my parents got them for me from the scrapbooking store in my home town. I have yet to even open them yet to try them out! I am going to have to find a nice free Saturday or Sunday to just play. My stash of stamped basket cards is desperately low and I need to restock before the State Line Friends Weaving Retreat in April where I will be vending.